Worth Jackson was the youngest son in a family of eight children born to Herschel and Maree Jackson. The family struggled during the Great Depression and moved several times before settling in the small farming community of Markleville, Indiana. The Jackson family farmed more than 87 acres of land, growing corn and beans. They also raised cows, lambs, and poultry. To earn money and help the family during the Great Depression, Jackson walked a rural paper route in the morning. With his three older brothers grown and out of the house, Jackson became the protector of his younger sisters, even checking their dates’ cars for alcohol, according to his sister Janet. Jackson was a member of the Markleville High School basketball team. 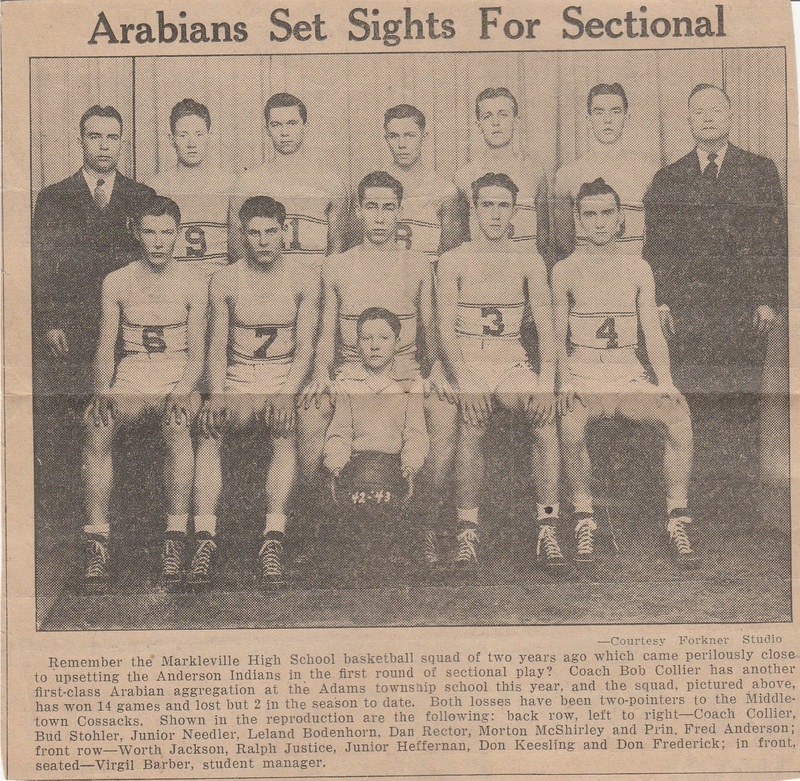 In 1943, during his senior year, the team finished the season with only three losses and upset the mighty Anderson High School team in the sectional tournament. That victory is still one of the most important events in the history of Markleville. While a senior in high school, Jackson was anxious to go to war. His two older brothers, Lyman and Donovan, were already serving in the armed forces, and several of his classmates had already been drafted. Jackson worried that even after being drafted, the military might exempt him because he worked on a farm. In a letter to his brother, Donovan, he wrote, “Dad has given me an opportunity to stay home and work the farm, but I’d rather go fight. They may find out that I am a farmer and make me stay home. Dad and Mom hope so. Ha, Ha.” With one month of high school remaining, Jackson received his draft notice. Markleville High School awarded Jackson his diploma early, and he went off to serve. While Hoosier soldiers and sailors fought on the combat front all over the world, the state of Indiana served on the front lines of the economic war and the battle of production. Factories switched from peacetime production to the production of war necessities. Factories operated 24 hours a day and this around-the-clock production meant the need for more workers. The need for workers led to employment opportunities for Hoosier women and Black Hoosiers. In Jackson’s home county of Madison, the automobile factories began producing all types of military equipment. Chevrolet produced cylinder heads for the Pratt and Whitney aircraft engine. The Pratt and Whitney engine powered several aircraft, including the P-47 fighter, P-61 night fighter and the C-46 transport. Guide Lamp of Madison County produced headlights for multiple military vehicles. Guide Lamp also manufactured cartridge cases, the Liberator pistol and the M-3 submachine gun. The Hoosiers at home adjusted to living with less just like the rest of the country. Gasoline, rubber, coffee, and sugar were rationed. Many families planted their own victory gardens. Hoosiers waited anxiously for reports on the war from fellow Hoosier Ernie Pyle. Pyle’s stories of the war ran in over 300 newspapers and told the story of the war through the eyes of the ordinary American soldier. Far too many Hoosiers did not return from war. Indiana lost more than 10,000 soldiers and sailors during World War II. 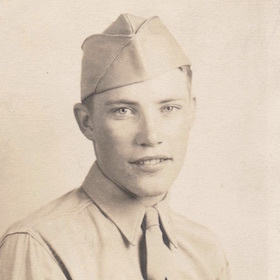 On May 11, 1943, Private First Class Worth Jackson received orders to report for active duty at Fort Benjamin Harrison in Indianapolis, Indiana. Assigned to the newly formed 272nd Infantry Regiment, Jackson attended Basic Training at Camp Shelby, Mississippi. He completed basic training in September 1943 and earned a rating of excellent in both character and soldier skills. Jackson was pulled from the 272nd Infantry Regiment and sent to North Africa. Arriving in Oran, in North Africa, on November 24, 1943, Jackson was assigned to several different replacement regiments during the next two months without seeing any combat. On January 17, 1944, Jackson joined the 168th Infantry Regiment. Jackson, along with 400 other replacement soldiers, spent a week training near the front lines in battle conditions and methods particular to the Italian campaign. After this training, Jackson and the others were ready for combat and were sent to front line foxholes near San Michele, Italy. Directly in front of the 168th Infantry Regiment were the German defensive positions known as the Gustav Line, designed to halt the Allied advance north to Rome. Adolf Hitler ordered his German defenders to hold the line at all costs. At the center of the Gustav Line was the abbey at Monte Cassino. Jackson could see the abbey high up in the mountains directly in front of his foxhole position. Monte Cassino gave German artillery spotters excellent observation of all Allied troop movements. As direct assaults on the abbey were under way, the 168th Infantry Regiment was ordered to attack the Gustav Line to the north and then move on Monte Cassino from the rear. On January 26, 1944, the 168th Infantry Regiment crossed the Rapido River and began their assault on the Gustav Line. The regiment encountered flooded fields, land mines, barbed wire, interlocking machine gun fire, and deadly accurate mortar, rocket, and artillery fire as they moved toward the hills at the base of Monte Cassino. Over the next several days, Jackson and the 168th Infantry Regiment captured key positions in the drive toward the abbey, including hills 56 and 213 and the town of Caira. On February 3, several companies of the 168th Infantry Regiment moved toward the town of Terrele. On the evening of February 4, 1944, Jackson’s platoon was sent out on patrol, in advance of the American lines. Their mission was to locate enemy machine gun and mortar positions. The platoon encountered a German patrol, and they were subjected to heavy machine gun and rifle fire. Jackson’s platoon dispersed and returned fire, but the enemy brought up reserve troops, and Jackson’s platoon was surrounded. Only six men returned from the patrol. Nine were captured, and 13 were killed. Worth Jackson grew up in the small, central Indiana farming community of Markleville. He was the youngest son in a family of eight children born to Herschel and Maree Jackson. The family farmed 87 acres of land, raised livestock and everyone was expected to help with chores. Worth was handsome, quiet, and modest. Worth had to wait anxiously for two long years to enlist, watching as his older brothers and friends were called into service. Finally, with two months of his senior year remaining, Worth received his draft notice. He was given the opportunity to stay home with a farmer’s exemption as his mother and father wanted. He refused the exemption as he told his family it was his duty to serve and he wanted to fight for his country. On March 1, with three sons serving in the military, a War Department official delivered Maree and Herschel Jackson a telegram informing the family that Worth was missing in action. A second telegram was received several months later confirming the death of their youngest son. Worth didn’t think he was invincible nor was he naive about the possibility of his death. 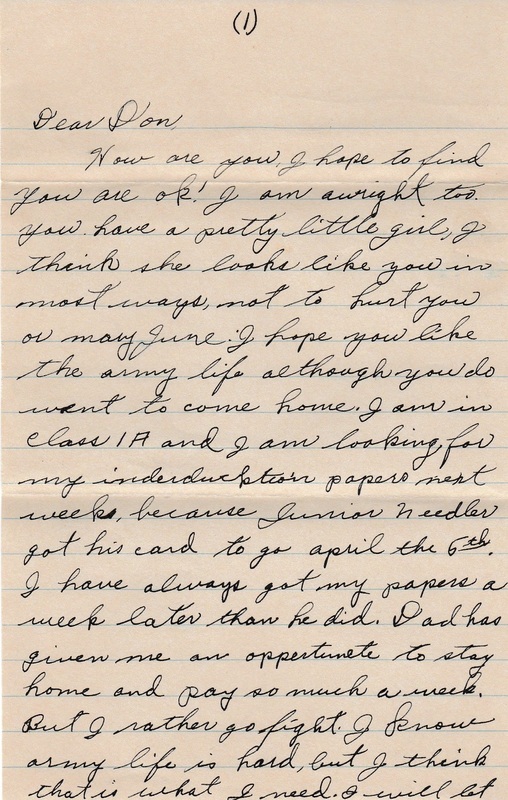 In a letter to his sister-in-law just two months earlier Worth wrote, “You all think I’m coming back, and I do too. But, if I happen not too, I want you to tell Mom I love her and everybody else. And please tell her that I’ve prayed”. Worth Jackson is my great uncle, the youngest brother of my grandfather, Ward Jackson. I grew up knowing that my grandfather lost a brother during World War II. I can remember asking my grandfather many times about his brother’s service, he did not have any answers. The Jackson family received very little information concerning Worth’s death after the war, so the details of Worth’s service were always a mystery. I tried and tried over the years to gather information on Worth’s service but always ran into roadblocks along the way. The Understanding Sacrifice program with National History Day and the American Battle Monuments Commission allowed me the opportunity to learn the full history of Worth’s service and travel to the sites in Europe that played a role in that service. I visited the Abbey of Monte Cassino, the photographs do not do the geography of Cassino justice. The hills around the abbey are much steeper than they appear and give you a better understanding of the difficulties our troops had in capturing the abbey. I crossed the Rapido where the 168th Infantry Regiment crossed and visited the site of the February 4 ambush. I will always be grateful to NHD and the ABMC for the chance to tell Worth’s story. Several family members were also a huge help in locating information and artifacts. Through the process, I was able to meet with family I had not previously met. To no surprise, most of the Jackson family members I encountered were as interested as I was in Worth’s service. 34th Infantry Division; Records of the Adjutant General’s Office, World War II Combat Operations Report 1940-1948, Record Group 407 (Box 8133); National Archives at College Park, College Park, MD. 34th Infantry Division; Records of the Adjutant General’s Office, World War II Combat Operations Report 1940-1948, Record Group 407 (Box 8136); National Archives at College Park, College Park, MD. 34th Infantry Division; Records of the Adjutant General’s Office, World War II Combat Operations Report 1940-1948, Record Group 407 (Box 8137); National Archives at College Park, College Park, MD. 34th Infantry Division; Records of the Adjutant General’s Office, World War II Combat Operations Report 1940-1948, Record Group 407 (Box 8260); National Archives at College Park, College Park, MD. 34th Infantry Division; Records of the Adjutant General’s Office, World War II Combat Operations Report 1940-1948, Record Group 407 (Box 8283); National Archives at College Park, College Park, MD. Anderson Daily Bulletin. “Soldier From Here Missing.” August 1, 1944. Anderson High School 1943 Yearbook, Vol. 1943, p.90-91. Best, Janet. Personal Interview. December 28, 2015 and March 23, 2016. Bogan, Sharon. Personal Interview. December 28, 2015. House Family Photographs. 2015-2016. Collection of Cary House. House, Virginia. Personal Interview. November 28, 2015. Jackson Family Photographs. 1943-1945. Courtesy of Cary House. Letter from Worth H. Jackson to Donovan Jackson. 1943. Courtesy of Phillip Jackson. Letter from Worth H. Jackson to Mr. James Heffernan. 1943. Courtesy of Patty Mauck. Letter from Worth H. Jackson to Mrs. Mary June Jackson. 1943. Courtesy of Patty Mauck. McMullen, Derrick. Personal Interview. March 26, 2016. Records for Worth H. Jackson; World War II Army Enlistment Records, 1938-1946 [Electronic File], Record Group 64; National Archives at college Park, College Park, MD [retrieved from the Access to Archival Databases at http://aad.archives.gov/aad/fielded-search.jsp?dt=466, December 31, 2015]. Sicily-Rome American Cemetery. Copy of Aerial Lithograph. October 16, 1964. American Battle Monuments Commission. “Worth H. Jackson.” American Battle Monuments Commission. Accessed January 13, 2016. http://www.abmc.gov/node/424358. Worth H. Jackson, Individual Deceased Personnel File, Department of the Army.